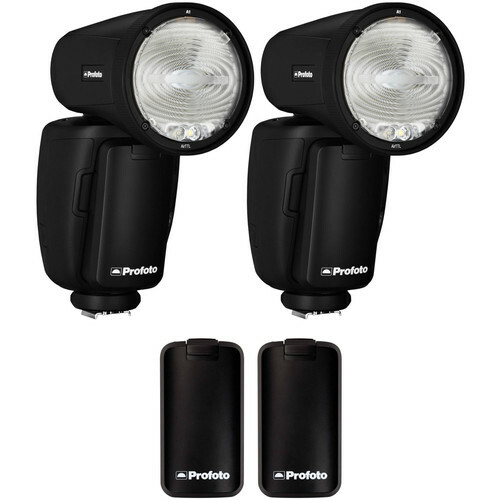 B&H has put together this Profoto A1 AirTTL-N Duo Flash Kit with Extra Batteries for Nikon to provide photographers with a sophisticated 2-light system with extensive modifiers, and with the kit's additional batteries, the ability to tap a reservoir of 700 full-power flashes for each A1. The kit includes two A1 on or off-camera flashes, each with two batteries, a Dome Diffuser, Wide Lens, Bounce Card, Flash Stand, USB cable, and a custom A1 Bag with shoulder strap. Profoto has put together this A1 Duo Kit for Nikon for photographers looking for a lightweight, on or off-camera mini-system with advanced features including TTL and total wireless freedom. The Duo kit includes two A1 AirTTL-N Flash Heads, each with a Li-ion battery that gets 350 full power flashes, a Dome Diffuser, Flash Stand, and a bag with shoulder strap. A charger that tops up the battery in 80 minutes is also included. Optional accessories include an Air Remote TTL transmitter for wireless control up to 300', a Soft Bounce, Bounce Card, Gel Kit, and Wide Angle Lens. The first thing you'll notice about the A1 is its 2.75" round, tilting, rotating head which is the physical feature most responsible for the A1's natural-looking light with its soft gradual fall-off. While we rarely use superlatives, we've heard the light quality described as "beautiful". The auto-zoom built into the head handles focal lengths from 32 to 105mm. You can override the auto-zoom function at any time and make your adjustments manually. A filter kit with graduated CTO conversion filters and a fluorescent filter is also separately available to modify the unit's daylight color temperature. Box Dimensions (LxWxH) 12.3 x 10.35 x 3.85"